CounterPipStock is an indicator, written to detect Forex wave and stock wave Direction, possible Reversal price and Corrective wave. 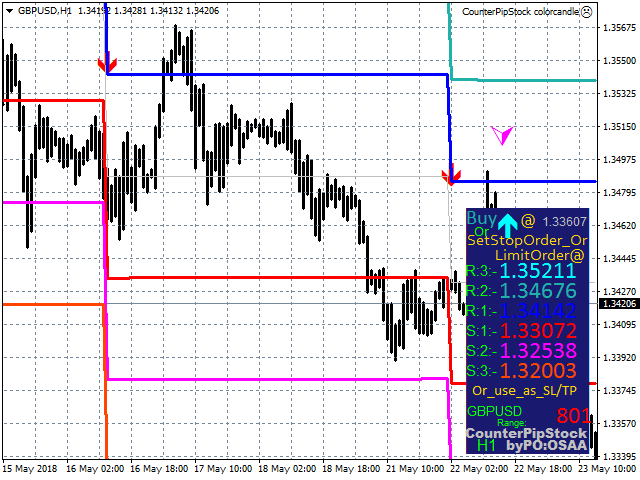 CounterPipStock is programmed for showing trend direction with a Red/Blue arrow. 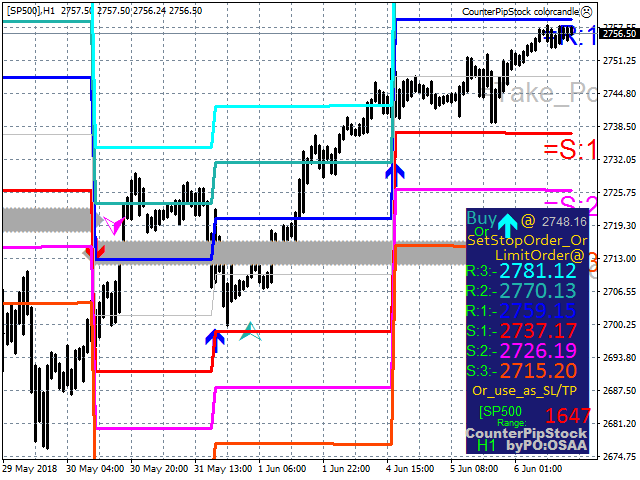 It shows a corrective wave with a fractal arrow, and also show reversal price with a cross arrow bar. CounterPipStock can be used on any pair on Forex, stock and commodity instruments, as well as cryptocurrencies. 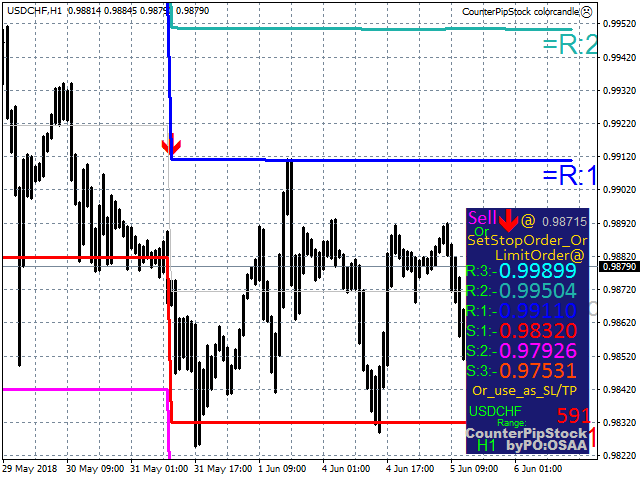 CounterPipStock is simple and easy to follow both for experienced traders and new traders. CounterPipStock comes with three support and resistance levels which can be used as stop loss price or take profit price. CounterPipStock clearly shows Confluence level. CounterPipStock comes with many functions, which can be enabled or disabled, depending on the user's needs. 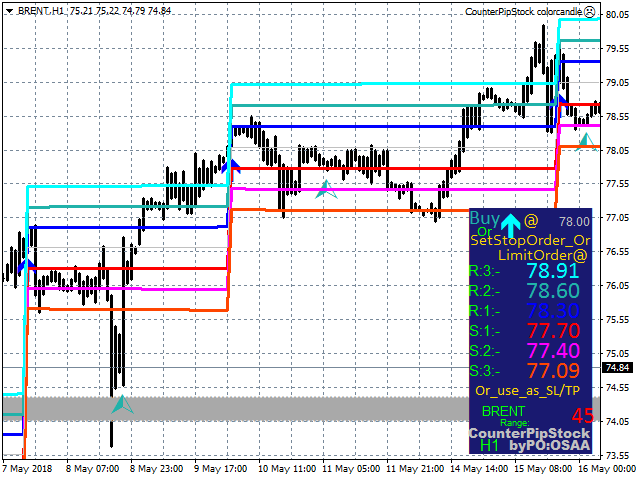 CounterPipStock is a multitimeframe indicator. 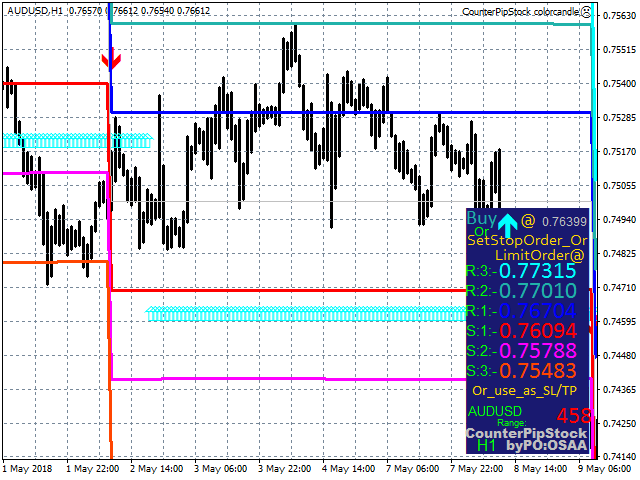 Confluence is formed as a result of multiple support and resistance level in the same region. Confluence level is the beginning of strong swing with good potential. 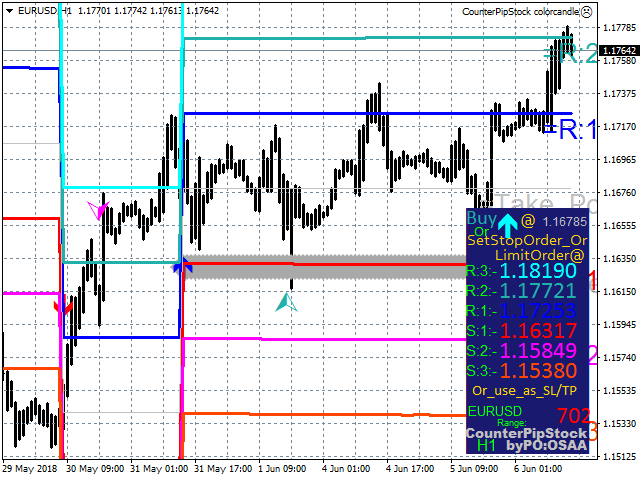 Reversal level can either be support or resistance level. 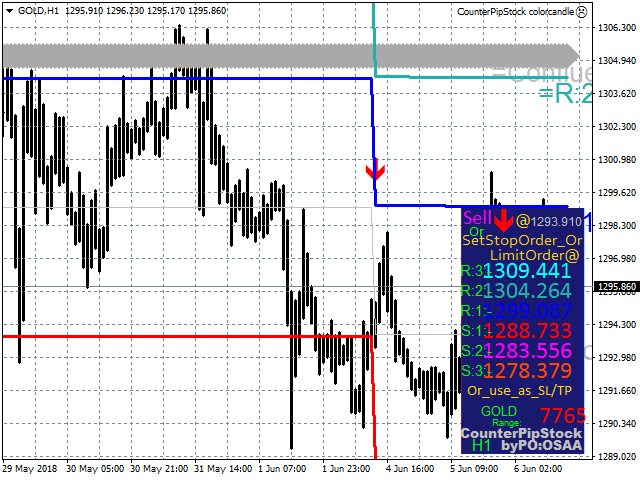 Wave Direction Arrow pops up after Confluence level. 0 - means my default settings. “POOSAA”. 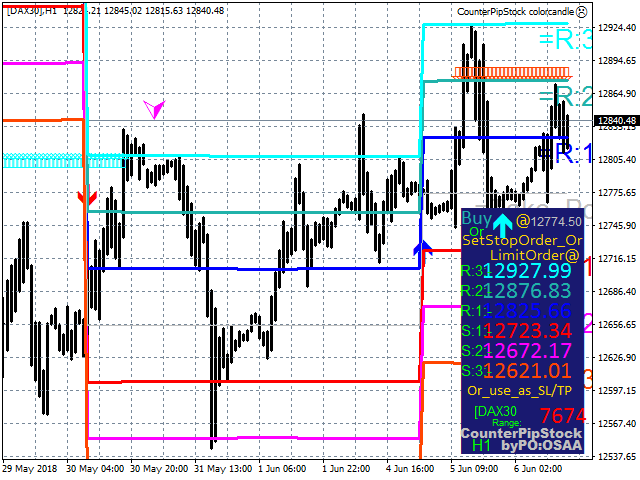 TimeFrame: This is to use Different time frame (try H4 on M15 chart). Fast_MA: The higher the number the stronger the signal (if greater than Slow_MA, you will get a Reversal Signal). Slow_MA: This represent Slow Moving Average. Signal_MA: This is for moderating the signal. Key_Ma: This works like moving average. 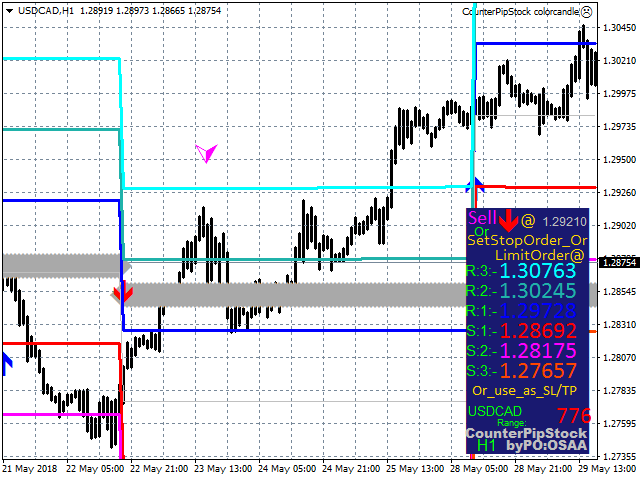 Poc: Use this to modify Confluence to either bull or bear. NoticeColour: To change background colour of the notice board. Arrow_TrendDirection: Set true to show Trending arrow. Arrow_ReversalWave: Set true to show Reversal arrow. Arrow_CorrectiveWave: Set true to show Corrective arrow. Confluence: Set true to show Confluence. Resistance_1: Set true to show Resistance_1. Resistance_2: Set true to show Resistance_2. Resistance_3: Set true to show Resistance_3. Support_1: Set true to show Support_1. Support_2: Set true to show Support_2. Support_3: Set true to show Support_3. Show_Label: Set true to show Buffer line Label.